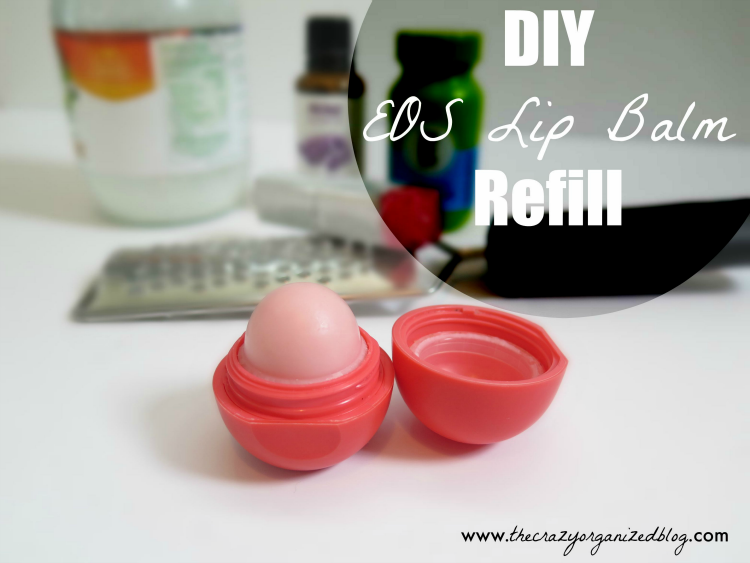 DIY Lip Balm Refill Using EOS Containers for a Fraction of the Price! I’m a lip balm addict. There I said it. But not because I want my lips looking great; it’s because my lips are ALWAYS chapped! Since I’m not giving up my two favorite beverages anytime soon and I can never seem to drink enough water, I always keep a super moisturizing lip balm on me. I love the idea of pairing this with a super easy DIY that will also save me money in the long run. 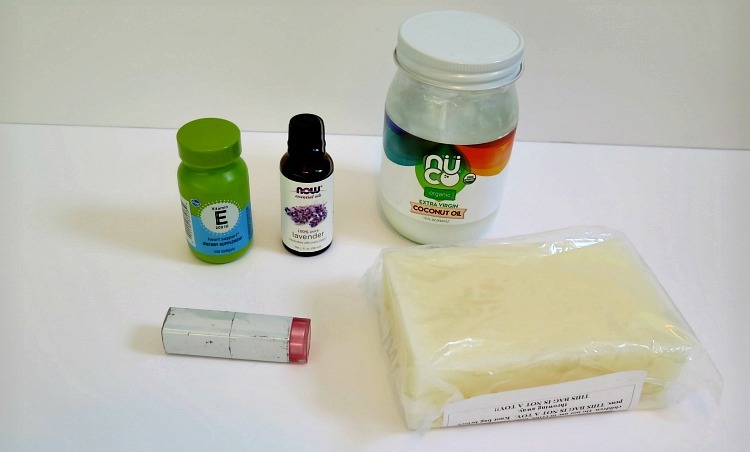 By using the ingredients below, the results are higher quality than a lot of store bought lip balms. You can easily make this in bulk to stock up for the winter or as neat gifts for friends! I bought the beeswax and essential oil on Amazon, as these aren’t the easiest items to find at the store. Since the beeswax came in a block, I use a cheese grater to measure out 2 teaspoons. When possible I try to select the items on Amazon that are eligible for ‘Amazon Prime’ which means the item has two day shipping for FREE (the Amazon Prime items tend to be cheaper as well). If you’re not an Amazon member and want to try out prime, you can try out a 30 day trial here. 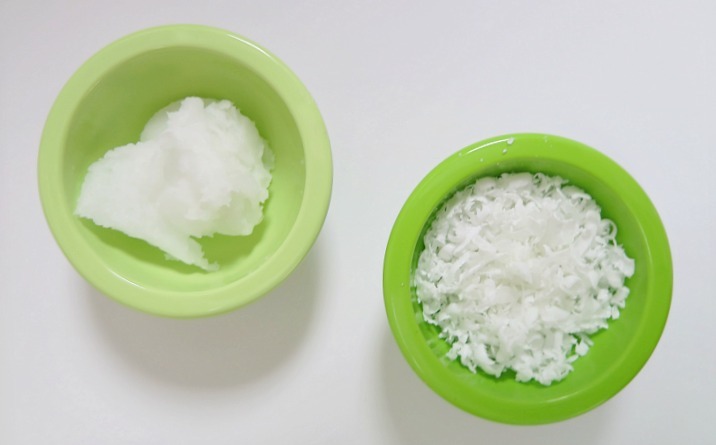 Combine the beeswax and coconut oil in a microwave safe bowl and heat for 1 minute or until melted, but not boiling. Then add a small slice of your lipstick to add a pop of color and your favorite essential oil. Break open a vitamin E capsule and add in the liquid contents. Put back in the microwave for 15-30 more seconds until everything is melted and stir. 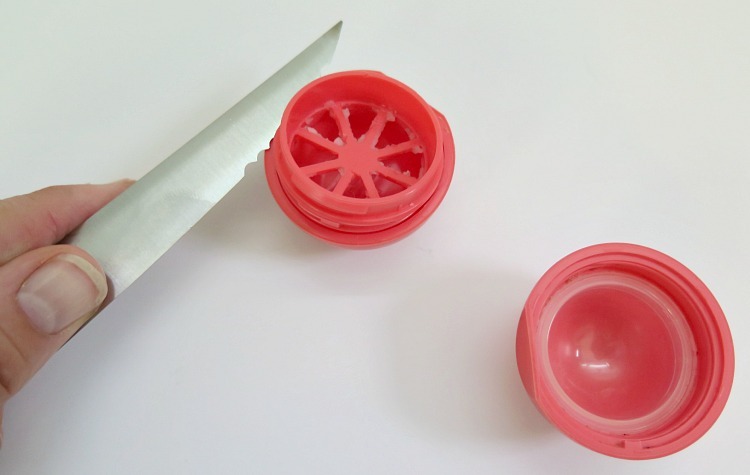 Screw the top (round) and middle piece of your EOS together and pour the mixture in. Fill it all the way to the top of the container. It’s OK if it flows over a bit! Pop the base back in, keeping it upside down. Then place in the fridge for 10-15 minutes. 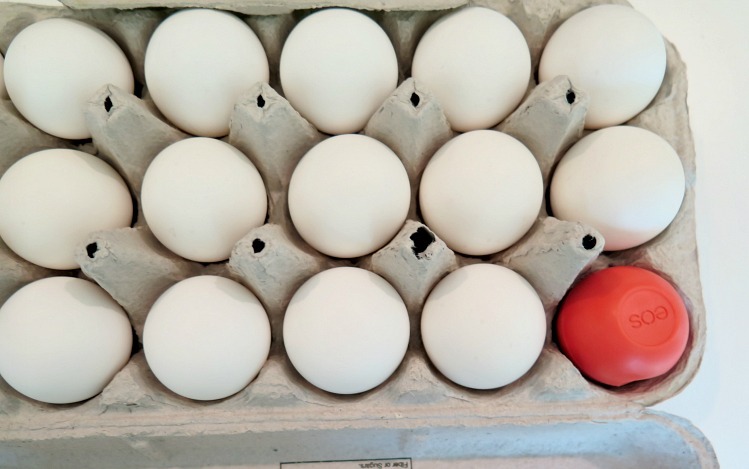 An easy way to keep it from tipping over in your fridge is to place it in an egg carton. 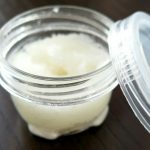 This recipe is for one EOS refill, but you can easily increase it. Just make sure to use equal amounts of coconut oil & beeswax. The rest of the ingredients can be measured out to your preference! After trying this the first time, I’ve been hooked! 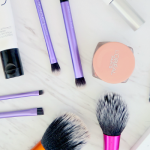 Goodbye chapped, dry lips. Hello moisture. 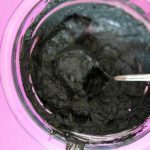 And this DIY lip balm refill was easier than you’d think! Previous Post: « Clean Your Coffee Maker! Well, you might have just saved me a small fortune. I have this crazy medical condition where I don’t make the hormones needed to process water, so my skin, and particularly my lips are always dry. It looks terrible, so I use a lot of lip balm. This sounds like a great way to combat that problem, while still keeping the budget in check. This should help a lot then! I hate hate hate spending money on pricey chap stick!! I just watched a video on this on my FB feed! I wondered if it actually worked.. awesome! Oh my goodness, this is BRILLIANT! I totally have to do this. Wait, does this mean I won’t have to buy any more lip balm (happy dance)! Haha, exactly!!! I’ve made tons of these and now it’s all I use! Thanks for stopping by! See you next week! Your liquid diet and mine are very similar. I also have a lip balm addiction. I’d love to make my own and this recipe doesn’t sound too hard. Thank you. Hallelujah! I am a lover of lip products, can’t explain it, but I love them. But I’m wary of the chapsticks and their chemicals and unhealthy ingredients. Thank you oh so much for sharing this!!! So glad! Yes, this is all natural stuff so it’s way better for you! Great idea! I didn’t think it would be so simple so I have to give it a try. Now I wish I hadn’t thrown away my empty EOS container a couple weeks ago! Honestly, it was really easy! 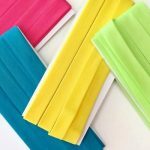 I’m never successful with complicated DIYs so all mine are pretty easy! What a great idea!! Thanks for sharing at Small Victories Sunday Linkup! Loving this tutorial! 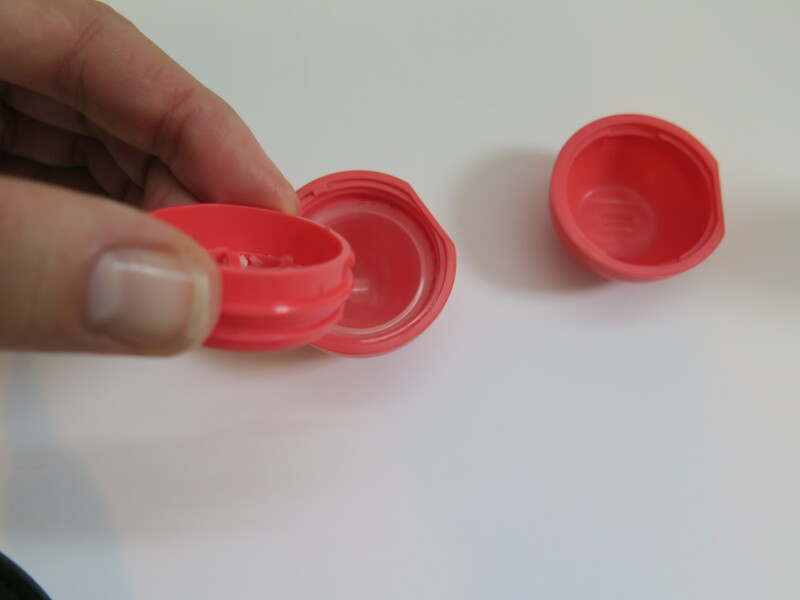 I always wondered how to refill those eos balms. Never did figure out how to separate the bottom two pieces. Yep! that’s the trick! Thanks so much for stopping by! I share your love of lip balm! Never considered making my own! How clever! Thanks for sharing with us at Merry Monday. Wow thanks for sharing how to make lip balm with us at Cooking and Crafting with J & J. Thanks so much! It’s so great for gifts!! This is such a great post. I am glad that I found your blog. I wish I hadn’t already trashed my EOS lib balm container. However I do have a Caramex on that about to finished. Needless to say what I am planning. Going to subscribe to your site for sure. This post is a real money saver indeed. Thanks again!! Thank you SOOOO mcuh! So nice! I really appreciate it! Thats awesome! Thanks for the tip I cant wait to try it out. What a great idea!! Thanks for linking up on My 2 Favorite Things on Thursday. Hope to see you again! Pinned! My lips are always chapped too. This would be a great addition to my link party about healthy living. Here is this week’s link. Very cool! I saw this awhile back, and I had to buy and EOS lip balm just so I could make my own when it was gone. I pinned for later! Love this! Guess what! I loved this post so much that I chose it to be featured for this week’s The Beautifully Creative Inspired Link Party. 🙂 Go grab a button you deserve it! This is such a great idea. My daughter is a lib balm addict. I think she would love to make her own. Great idea! I have a lot of coconut oil, because I use it for everything but mostly as a moisturizer. I need to start making my own balm since my kids steal mine all time and they end up in the wash. That’s expensive! Thanks for sharing with Saucy Saturdays! This is great! I’m almost out of my favorite EOS, and I think I have all these ingredients except the Vitamin E. And I’m with you on the wine/coffee/water thing! Oh I love this so much! Thank you for sharing!! I’m the same way! Total lip balm addict. Constantly chapped lips, I have tons of these EOS lip balms all over the place in various levels of use. I can’t wait to make this. Thanks so much!